Judy Rodman - All Things Vocal Blog: Voice Feeling A Little Guarded? Still guarded even after the storm is over? 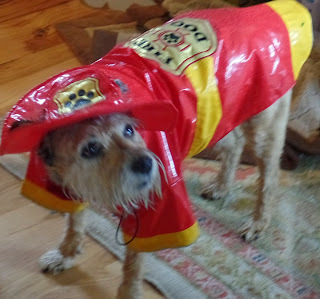 My sister & brother-in-law's poor rain-soaked little dog Nick illustrates perfectly how we feel when we are not sure how our voice is going to perform. But the guarded stance for voice is a counterproductive tactic. Years ago when I lived in Memphis and had a busy vocal career that included staff jingle singer, studio background session singer and top-40 club singer (yes, my voice was working overtime), my voice was damaged from an endotracheal tube. I spent two years getting most of it back, but from my previous vocal ability I knew I was still missing some control, resonance and range. After moving to Nashville, I began taking vocal lessons from a beloved coach most Nashville session singers were going to named Gerald Arthur. The very first thing he taught me was that I must stop guarding my voice. Like a well meaning over-protective parent, the guarded stance is by definition, tightly defensive physical posturing. The voice will never perform well that way. This contracting stance tightens the ribcage, the throat channel and interferes with the total commitment to communicate (because your mind is distracted trying not to hurt your voice!). The voice parallels many athletic sports. When a baseball player gets hit by a pitched ball, he actually becomes more prone to injury because he assumes a more guarded stance at the plate. When the voice is injured, our instincts tell us we must protect it from further abuse, and in many ways that is true. But there is a right and wrong way to protect ourselves. Many times injured athletes must not only rehabilitate their injured tissues, but also their psychological head space. They must regain their trust in themselves and in their flexible, unguarded openness to be able to get back the options of movement they need to for control and accuracy at their sport AND to avoid future injury! The same is true of the voice. Vocal rehabilitation should protect the voice from re-injury by giving it better technique than ever before. Often it's important to take a limited time for healing, including vocal rest (SILENCE), cancelled engagements and recording sessions, and light exercises to increase flexibility and better coordination of tissues. But if you find you have to guard your voice, something is wrong. You may be pushing it with bad technique, too soon, and/or too hard. Do a personal inventory and take care of any physical, nutritional, mental and psychological needs or deficiencies. Let any vocal cord infection and swelling heal. [If in doubt, get to a doctor] Consider a period of partial or complete vocal rest. Do slow physical stretches before light physical workouts, stretching again afterwards. 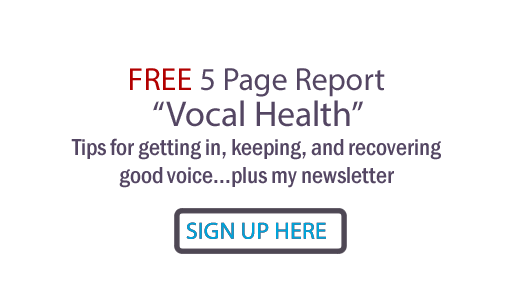 Do targeted vocal exercises with great form that get the chest, throat and mind open. Check your speaking voice! The tight talking habit is frequently a sneaky vocal saboteur. If you can't unguard your voice by yourself or with efforts from wise friends and loved ones, do seek out the help of professionals such as psychologist, nutritionist, medical doctor, physical trainer, chiropractor, therapeutic masseuse, and of course, an intuitive vocal coach. Whatever you do... if it makes your voice feel worse afterwards it's NOT the right strategy or exercise. Stop it and seek out something else that you can trust - so you can stop the counterproductive guarding that will never give your voice the freedom it needs. What about you? Ever assumed a guarded stance that just didn't want to let go? What helped?